NORAD and USNORTHCOM Instruction (N-NCI) 10-154, NORAD and USNORTHCOM Publication Series provides further background on the Publication series policy and purpose. The NORAD and USNORTHCOM Battle Staff is activated during contingencies and crises to facilitate the Commander’s timely strategy and operational decision making. 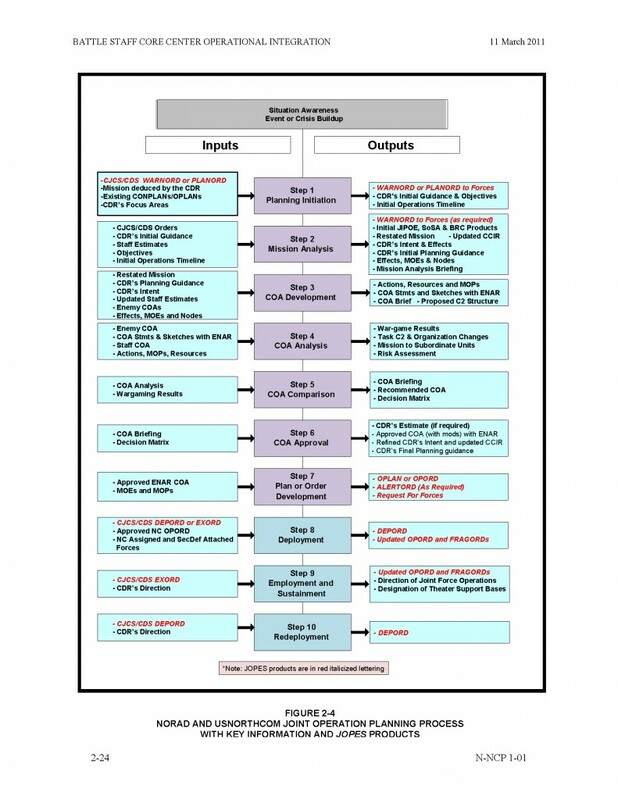 The NORAD and USNORTHCOM Battle Staff task organizes using an adaptive joint headquarters construct, integrating J-code staff, special staff and agency liaisons into various Battle Staff nodes. This cross-functional Battle Staff organization ensures processes critical to the NORAD and USNORTHCOM missions are reliable, repeatable and efficient, and minimizes functional stove piping. The adaptive joint headquarters construct evolves beyond the traditional J-code staff organization thereby creating a Battle Staff organization optimized to execute cross-functional, joint war fighting processes to improve collaboration and increase understanding of the operational environment. Though NORAD and USNORTHCOM are separate commands with different establishing authorities, they have complimentary missions. The two Commands share common values, understanding the urgency and significance of their duties in light of very real and present dangers. Operations and incidents could occur within the NORAD area of operations (AO) and USNORTHCOM area of responsibility (AOR) that would involve responses by both Commands. Canada and the United States also share a common border and have mutual defense and civil support and civil assistance interests. 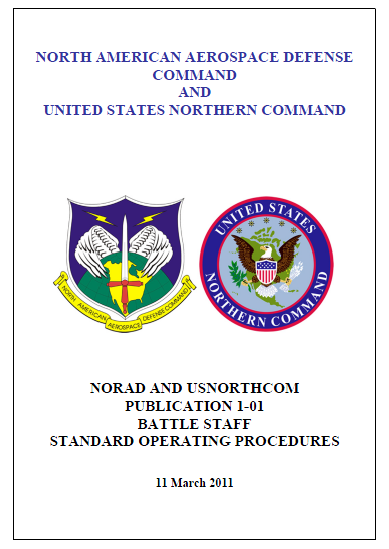 The NORAD and USNORTHCOM Battle Staff organization and processes defined in this BSOP are intended to ensure the two Commands’ missions are accomplished effectively, efficiently and in close cooperation. Headquarters NORAD and Headquarters USNORTHCOM accomplishes its routine operations within the traditional J-code staff organizational structure and transitions to the NORAD and USNORTHCOM Battle Staff construct in response to preplanned events or contingencies as directed by the Commander. For preplanned events (contingency planning), the NORAD and USNORTHCOM Chief of Staff (N-NC/CS) will designate an OPR to stand up a joint planning team (JPT) or operations planning team (OPT). These teams can be led by any directorate, but are typically led by the Directorate of Strategy, Policy and Plans (N-NC/J5), NORAD Directorate of Operations (N/J3) or USNORTHCOM Directorate of Operations (NC/J3). The work of the JPT or OPT is conducted outside of the Battle Staff organization and processes, but may be transitioned to the Battle Staff’s crisis action planning (CAP) responsibility as the preplanned event approaches. The Battle Staff is designed to provide cross-functional expertise and leverage information technology to improve collaboration and decision superiority in CAP. The NORAD and USNORTHCOM Battle Staff’s primary role is to support the Commander’s operational decision-making process during CAP and execution. The Battle Staff coordinates and collaborates with higher, adjacent, supporting, supported commands and agencies internal and external to the Department of Defense (DOD). This BSOP generally assumes Battle Staff activation will be required for a period between 12 hours and 30 days. However, such activation (Chapter 2) is scalable based on the nature and magnitude of the crisis or contingency.